The boat is in great conditions, clean, and ready to go. It has great electronics to make the boating safe and the fishing a success. As per seller, he does all the maintenance since he is a certified mechanic and all systems working smoothly. Stock #164207 Excellent condition Grady White Chase with Trailer. Very well taken care of boat !! Reason for selling is new vessel. 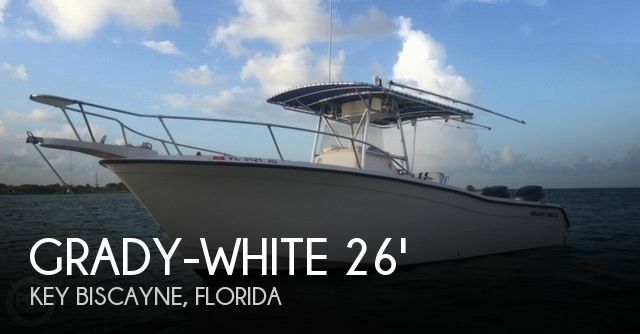 1999 Grady-White 263 Chase Grady-White 263 Chase Price INCLUDES 2016 aluminum duel axel, disc brake trailer Grady-White has long been known for making the finest outboard powered, walk-around center consoles ever to hit bluewater or the Great Lakes. This hull design brought Grady-White to the top of the class not only in layout and construction but in ride and sea-keeping ability. Modifications were made to the origional Sea V2 concept, such as widening and reversing the chines, tweaking the strakes and obtaining the optimum deadrise angle to reduce time-to-plane and improve stability. You really must experience this revised hull design firsthand to appreciate just how a midsize, outboard-powered hull should run in all types of sea conditions......especilly in rough seas! The layout of the 263 Chase features more than 52 sq ft of cockpit space aft of the steering station, more than most on the market. The 263 offers 29 inches of cockpit depth aft, 30 inchs amidships and 19 inches on either side of the split forward casting deck. Great for children on board. Running forward and aft when fighting gamefish is no problem, thanks to the generous 20 inches of pass-through spact between the center console and the cockpit liner sidewalls. The console inself houses over 6 feet headroom, an locking storage closet, twin shelves, storage net and small hanging locker. This space also provides for the head which has holding tank with deck pump-out or over the side with the macerator. 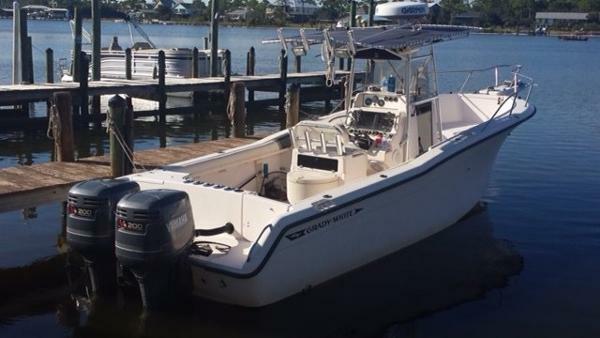 2001 Grady-White 263 Chase Center Console 2001 Grady White 263 Chase Center Console Fishing machine with legendary Sea V2 hull design. 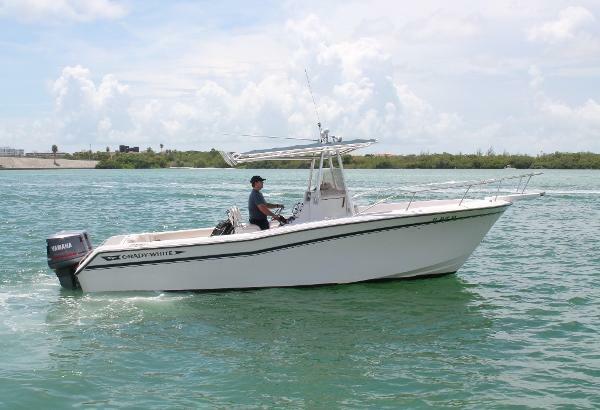 Powered with good running Yamaha 200 Horsepower High Pressure Direct Injection Engines with 1,438 hours. 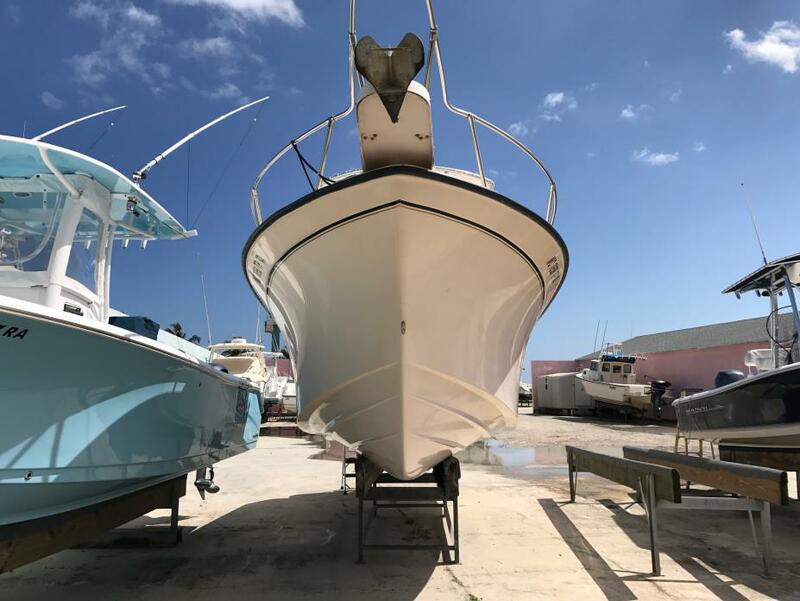 Boat comes equipped with factory T top with rod holders and PFD storage, Anchor windlass, Outriggers, Underwater lights, Newer upholstery, SS props, Freshwater shower, Raw water washdown, Porta potti, Swimladder, Compass, Large livewell, and more. Electronics include Garmin 3206 color GPS/Chartplotter, Humminbird 798 sonar/fishfinder, New Jensen stereo, VHF ship to shore radio, Furuno radar, and Guest battery charger. 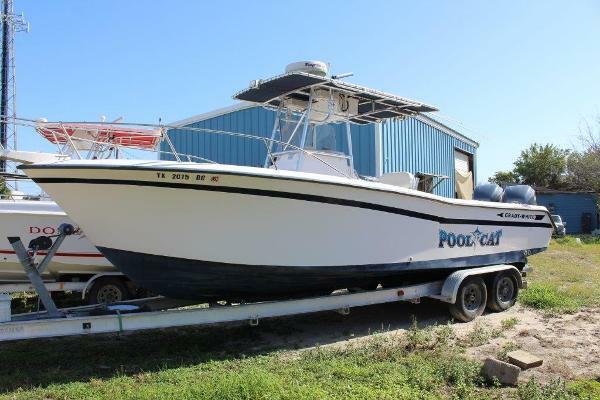 Boat is in good condition and priced to sell at $25,995 or best offer. Hull is bottom painted and does not come with a trailer. 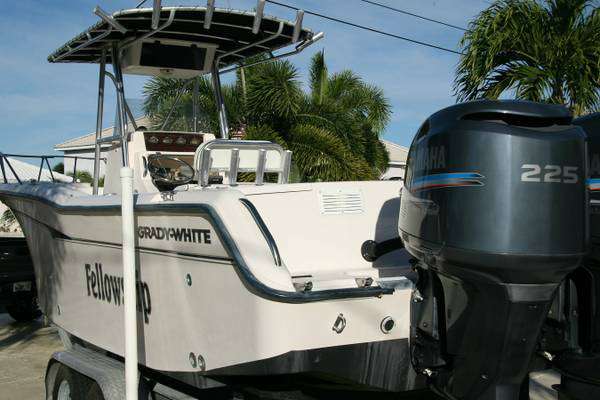 Located on the West coast of Florida on Longboat Key at Cannons Marina Floridas oldest Grady White dealer. Please call or email to set up an appointment or if you have any questions. 1996 Grady-White 263 Chase CC This is a nice boat. Twin Yamaha 200's with about 400 hours since a rebuild in 2012. Also: 8' 6" Beam - Weight 3,975# - 200 Gallon Gas Tank - Aluminum Triple Axle Trailer - VHF - Garmin GPS/FF about 2 years old - Radar - Kept in Dry Storage - More. Call or email with questions. 1999 Grady-White 263 Chase Grady White 263 Chase center console. 2006 Yamaha 225hp four stroke motors. 298 hours. Motors are spotless.. 100 hour service just performed by Hix Marine. 11 hours of use since service. Brand new Garmin Chart plotter/sounder 7" display, new transom mount transducer. New canvas on T-top 6 weeks. 2009 First Load tandem axle trailer, brand new tires 6 months. No Brakes.. Very heavy boat..built for blue water action with a great ride. Boat will run...great range carrying 200 gallons of fuel. Most of these boats came with twin150's and 200's... The motor package is perfect plenty of power when and if you need it. WE CAN SHIP THIS BOAT ANY WHERE IN THE WORLD!!! EMAIL FOR QUOTES! 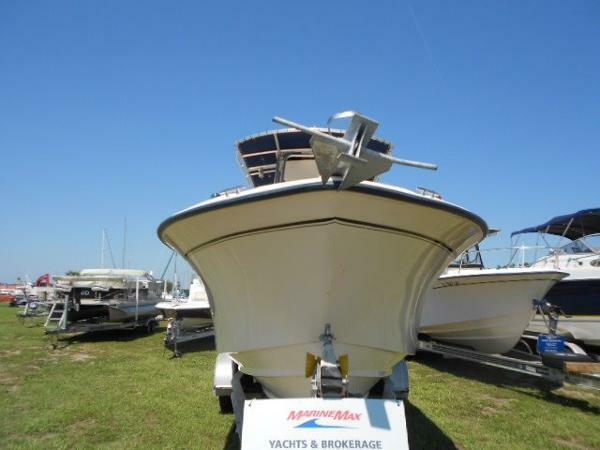 FULL THROTTLE MARINE SALES LLC IS A FULL SERVICE BOAT & YACHT BROKERAGE. TO VIEW MORE PICTURES AND VIDEO PLEASE VISIT OUR WEBSITE. WWW.FULLTHROTTLEMARINESALES.COM .WE CAN ALSO PROVIDE A SHIPPING QUOTE IF YOU NEED THE BOAT TRANSPORTED! IF YOU HAVE A TRADE LET US KNOW WHAT IT IS! WE CAN SELL IT FOR YOU OR GIVE YOU A TRADE IN NUMBER ON IT!! WE CAN HANDLE EVERY ASPECT OF BUYING AND SELLING A BOAT FOR YOU. ANY WHERE FROM SHOWINGS,SURVEYS,AUCTIONING,BUY,SELL,TRADE,CONSIGN, INSPECTIONS,SHRINK WRAPPING,SHIPPING,IMPORTING,EXPORTING,RIGGING,CUSTOMIZING ETC...WE HAVE MANY OVERSEAS CLIENTS, AND WE AIM TO PLEASE EVERY ONE! PLEASE GO TO OUR WEBSITE AND CLICK ON THE EBAY LOGO ON TOP TO VIEW OUR ONLINE AUCTIONS! FOLLOW US ON FACEBOOK.COM AS WELL..WE HAVE TWITTER, YOU TUBE, AND INSTAGRAM. SO PLEASE ASK FOR A QUOTE FOR ANYTHING, CALL US ANY TIME - 2006 Yamaha 225hp Yamaha 4 strokes just serviced! 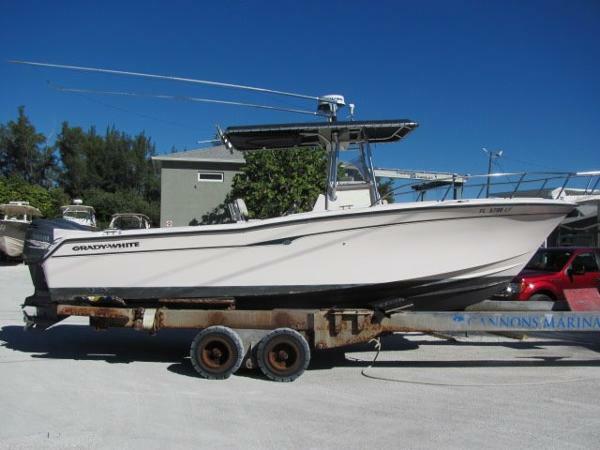 1995 Grady-White 263 Chase This center console has been well maintained, stored indoors since new. Lift kept currently since May 2015. 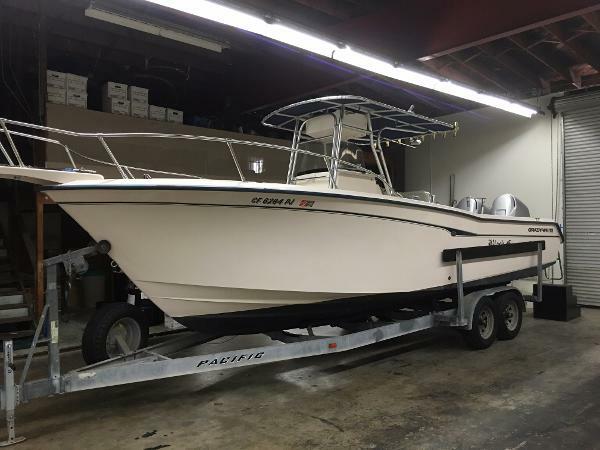 T-Yamaha 200HP's, Trim Tabs, Baitwell, Locking Rod Holders, Spreader Lights, Fresh Water Shower, Stand-Up Head, VHF, New Stereo, Lowrance X70A, Compass. Please call for details.